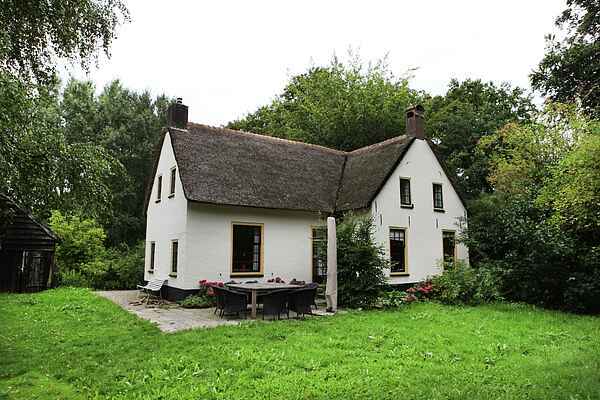 This holiday home was built around 1500 as a gamekeeper's house for the Heerlijkheid Mariënwaerdt country estate. Many generations of gamekeepers have lived here. After a serious maintenance backlog, this monument was fully restored in 2011 with a new thatched roof, oak floors, central heating, three bedrooms and a modern bathroom and kitchen. The house was decorated with a stylist in the style of "Buitenleven" magazine as a cosy holiday home for six to eight people. Around the the house there is a delightful garden with a magnificent view over the fields. From the front door you can work in the lanes for a delightful walk. The Mariënwaerdt estate is an extensive family estate in the Betuwe, located in the basin of the Linge river. It's pleasant to spend time in this oasis of peace. On the wide green fields there is a blissful silence. There are deer, hares and pheasants living here. Mariënwaerdt is at home the whole year round. In late spring, the region lets you enjoy the beautiful blossoms, and in summer you can have a lovely swim in the Linge river and in nature you can gather nuts under the many nut trees on the country estate. On the country estate there are beautiful hiking and cycling routes with breathtaking views. Another holiday home named Hofstede de Abtsbouwing is also located on the Heerlijkheid Mariënwaerdt country estate.